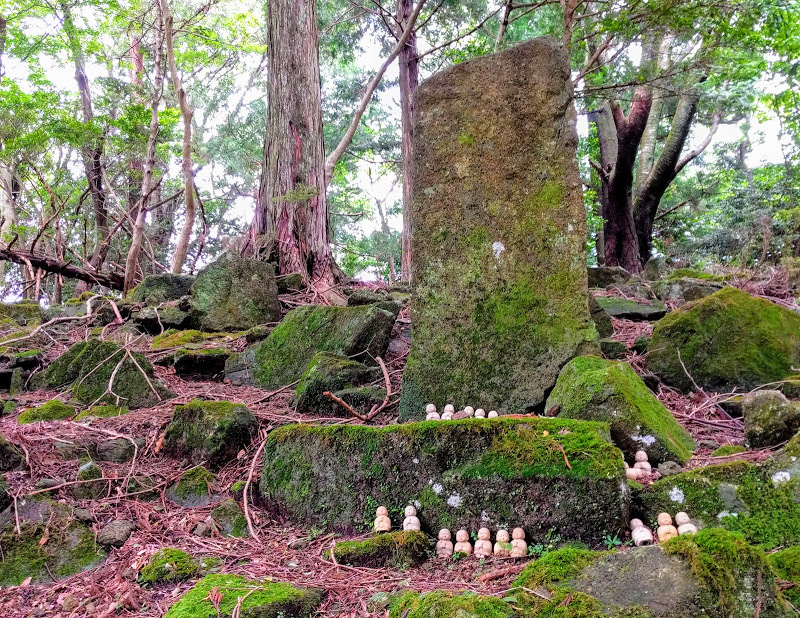 I’ve just been sent on a business trip to Japan to walk along the Kumano Kodo pilgrimage path! Well, okay, they thought they were sending me to a conference on calendaring interoperability standards, but that wasn’t really the important bit. The Kumano Kodo is a strikingly ancient series of paths in the Wakayama province of Japan, used by pilgrims to reach the three major Kumano shrines for at least a thousand years: they’re a combination of Shinto, Buddhist and Shugendo (which, if I understand it correctly, is the local fusion religion combining elements of both plus imports from the local animist religions of the area). 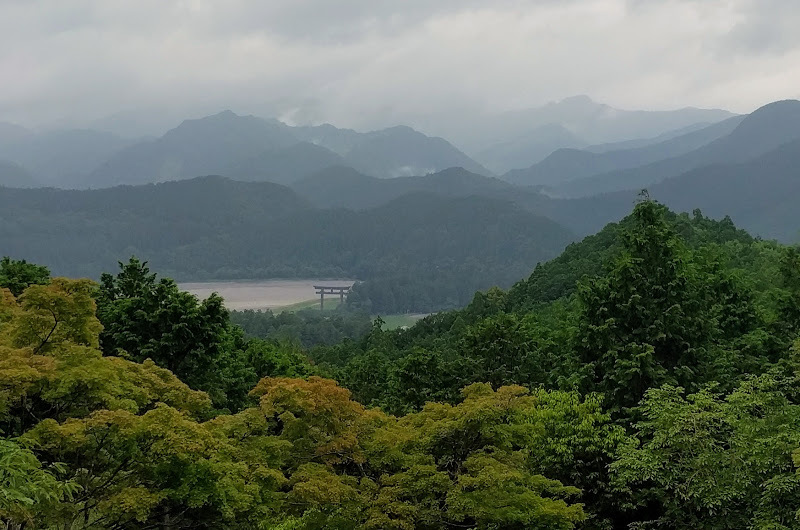 All the routes take days to complete; the most common route is from Kii-Tanabe on the west coast to the Kumano Nachi Taisha temple complex on the east coast, which takes about a week, but there’s months’ worth if you want (some of which is quite tough). 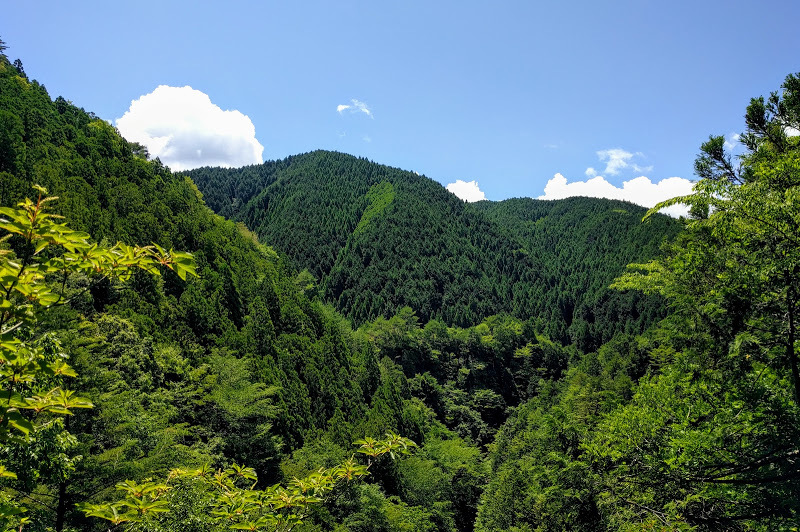 Sadly, I only had a few days, and was only able to do two legs of the walk; I bussed to Yonumine Onsen, roughly halfway through the Kii-Tanabe to Nachi route, and walked the rest of the way to Nachi in two days (plus a day exploring in and around Yonumine Onsen itself). I wish I’d been able to stay longer. 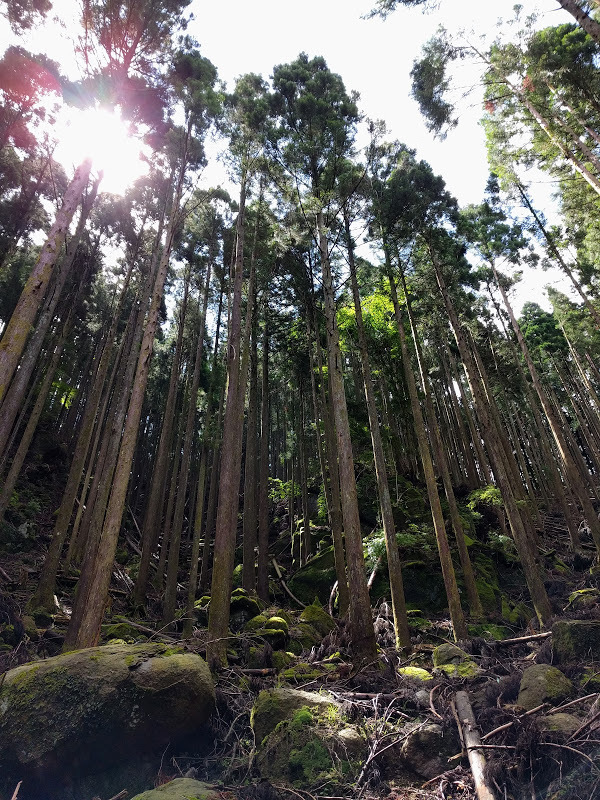 The forests are astonishing and largely unphotogaphable, a deep rich green dripping with moss and vines, varying from pines to cedar to other tries I was unable to identify. 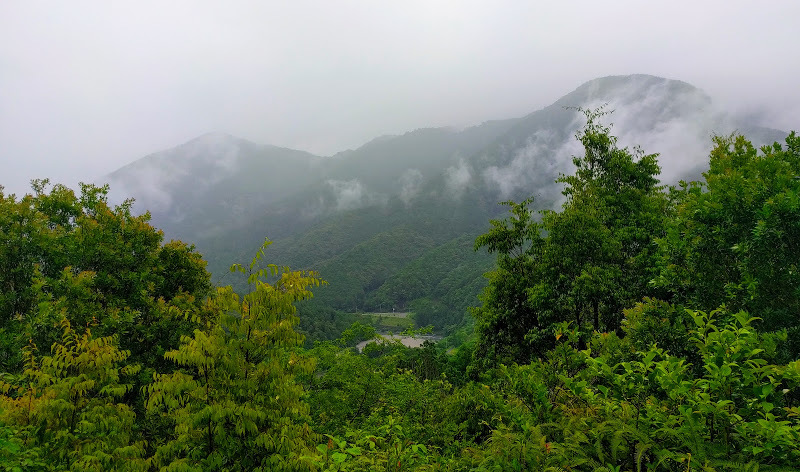 The mountains are craggy and intricate and the path winds in and out of rocky gullies and around steep terraces, with little oji shrines dotted along the path, most with little stories attached. I stayed in local guesthouses, very traditionally Japanese, and learnt all the ins and outs of wearing a yukata (trans: dressing gown) and how to use a Japanese bath. 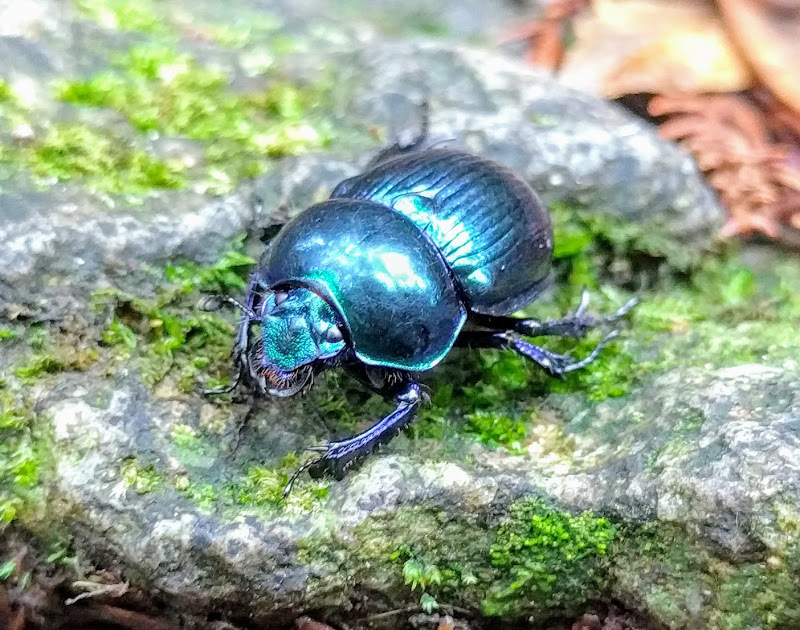 I ended up with about three hundred photos, and trying to edit them down into just the highlights was practically impossible, but here we are. 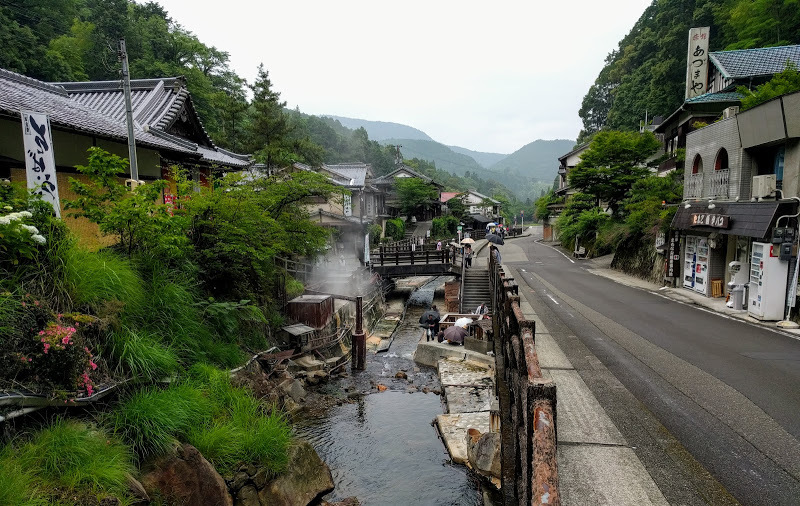 The little town of Yonumine Onsen, noted for its hot springs for 1800 years. 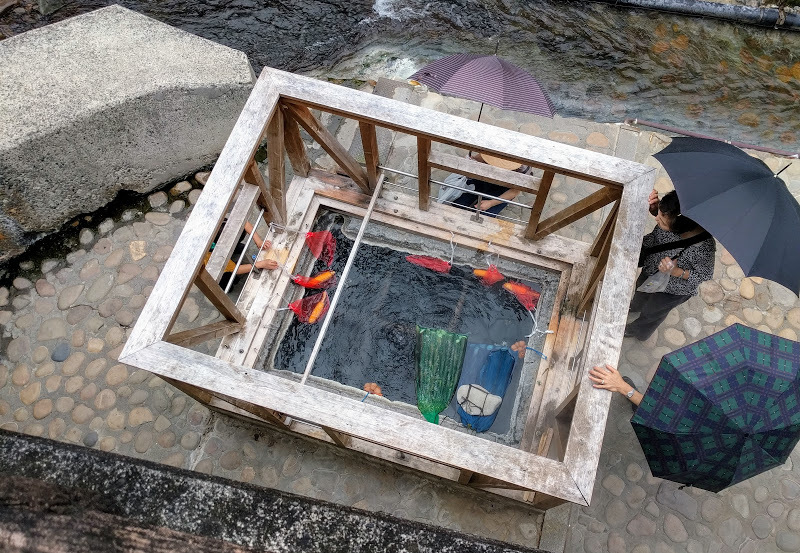 People cooking corn on the cob and eggs in a hot spring in Yonumine Onsen. 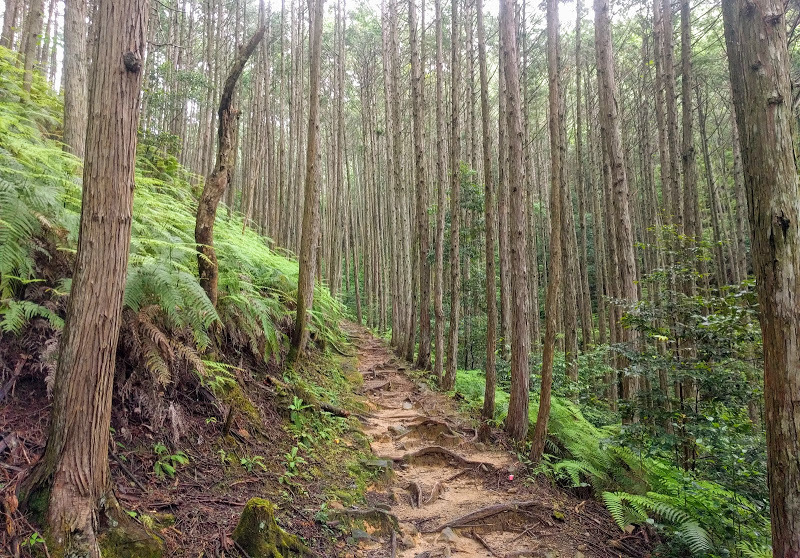 A section of the Kumano Kodo path leading from Yonumine Onsen to Hongu --- very steep and rugged. 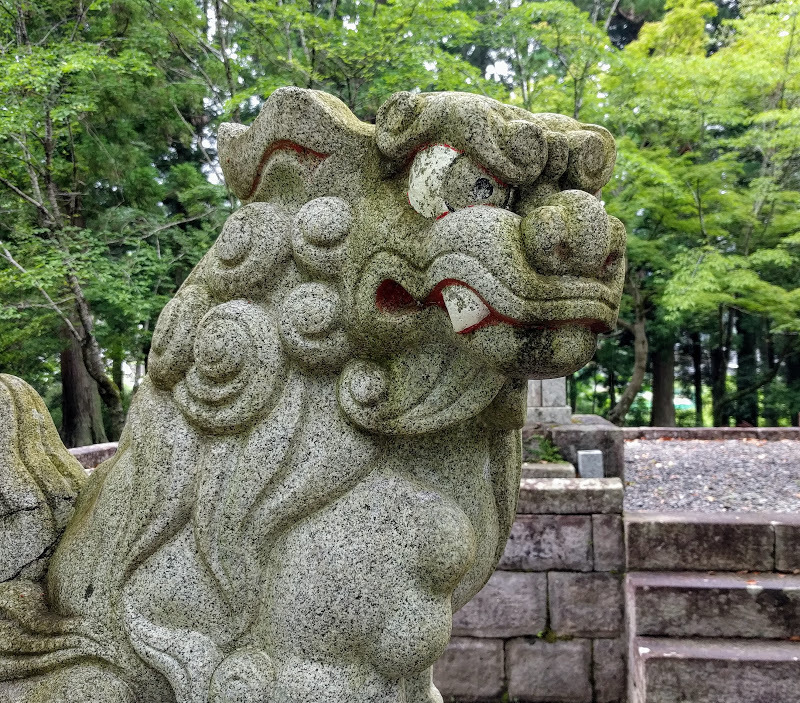 Detail of a lion guarding a shrine at Kumano Hongu Taisha. 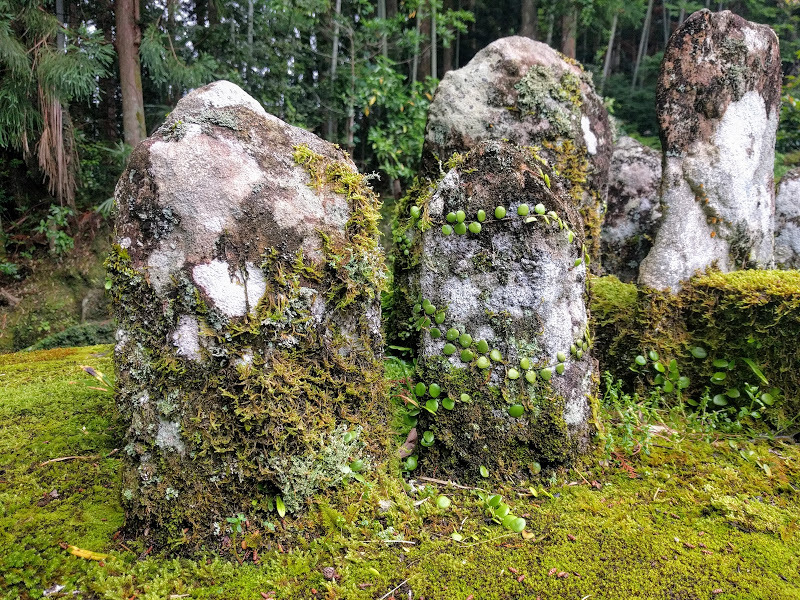 Ancient Shugendo gravestones in a little cemetery near Kumano Hongu Taisha. 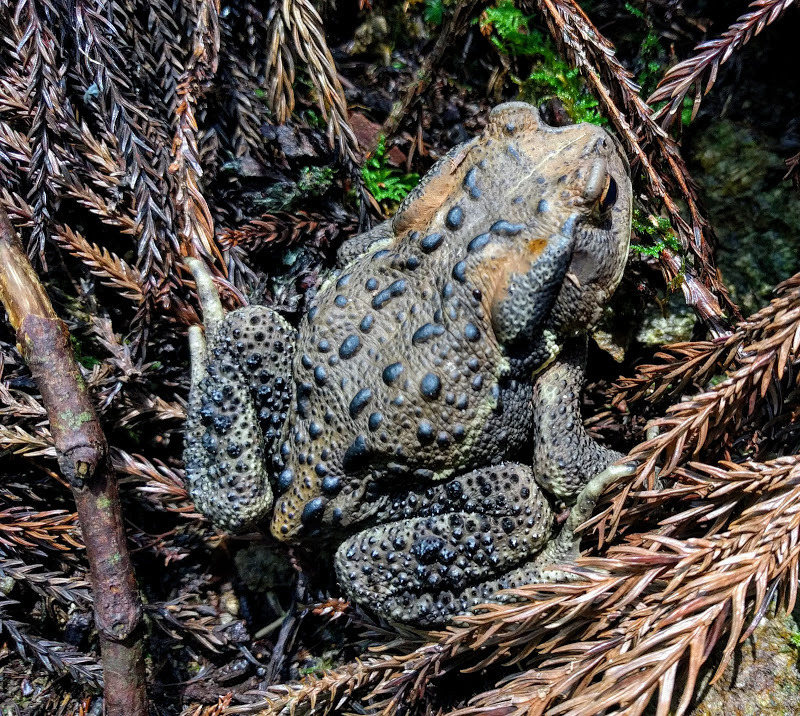 Luckily, the forests are just as beautiful in the mists as they are on clear days. 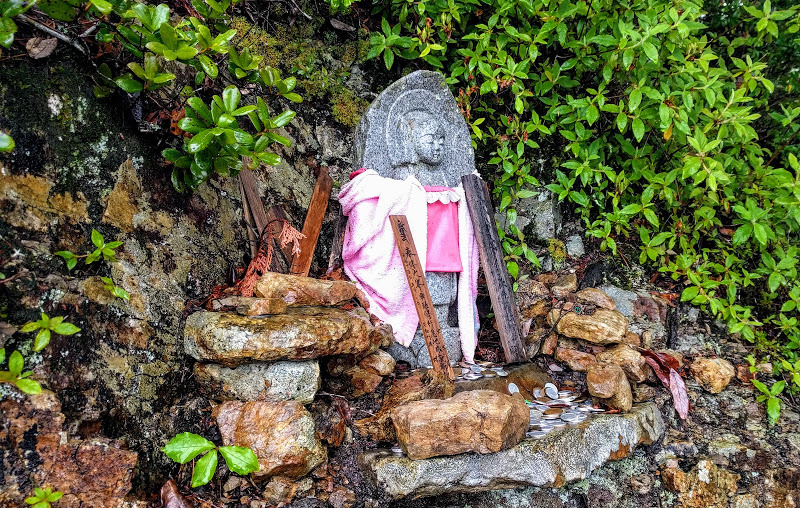 An oji shrine along the path. 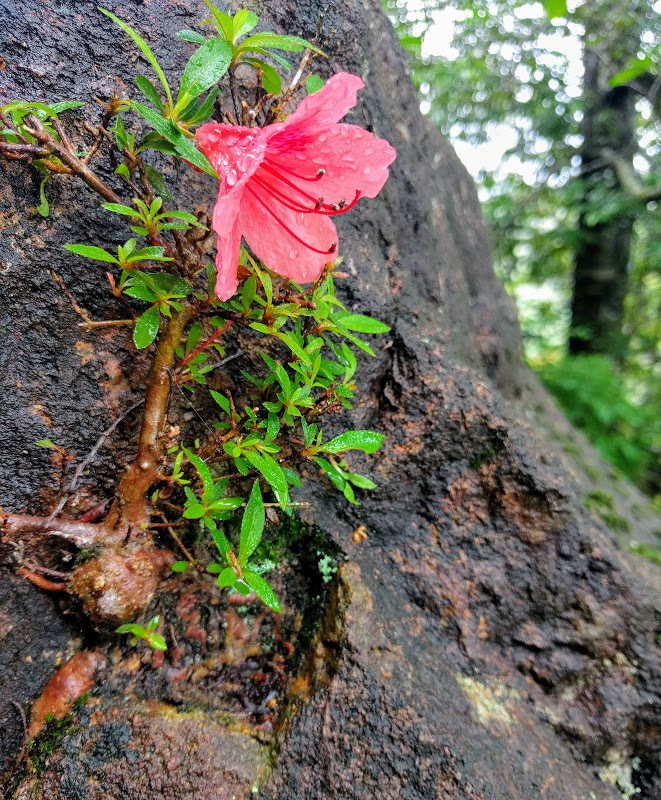 Detail of a flower growing in a rock crevice. 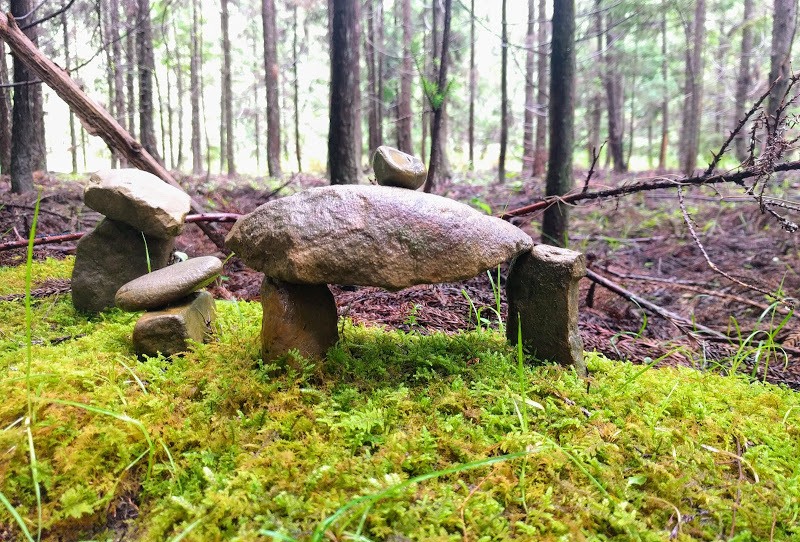 The world's smallest standing stones. 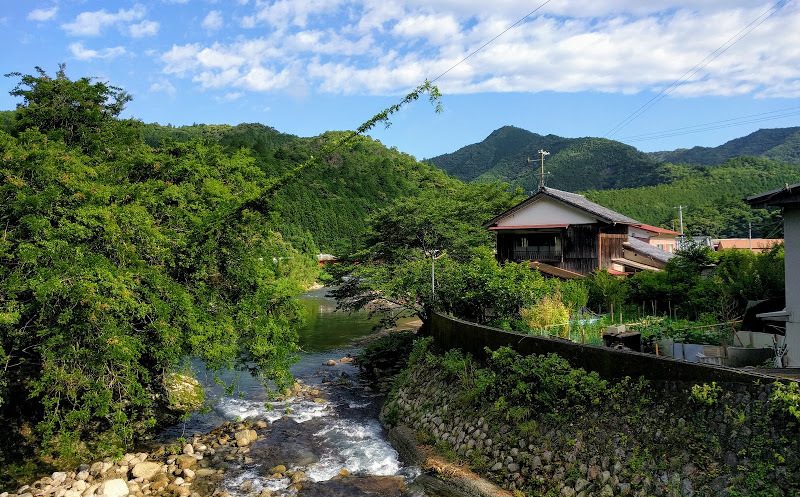 Koguchi village, on a rare sunny day. My guest house here was a converted school. 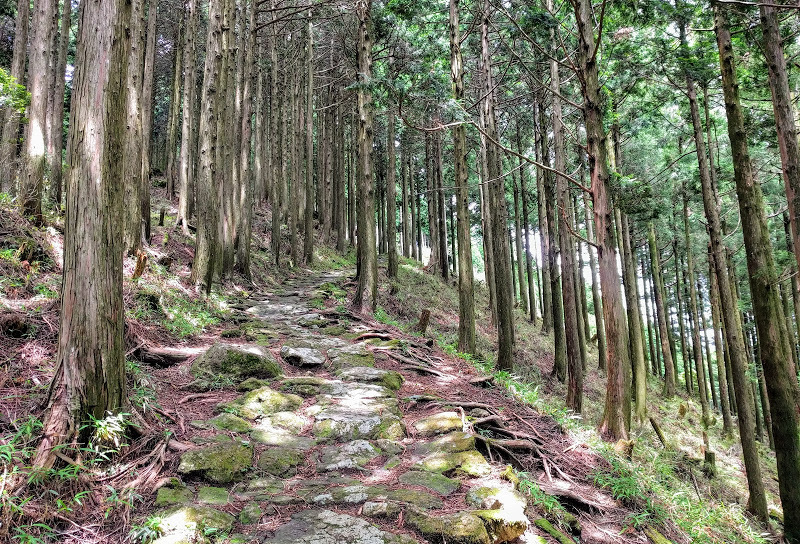 The legendary Body Breaker climb out of Koguchi: 800 vertical metres in four horizontal kilometres. 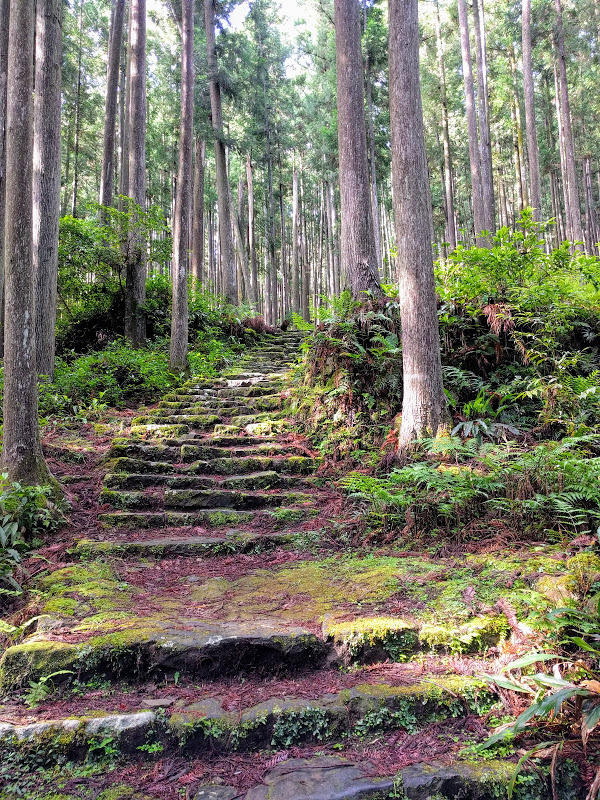 The ancient broken stone steps are less help than you'd think. It's hard to convey just how incredibly green the forest was. 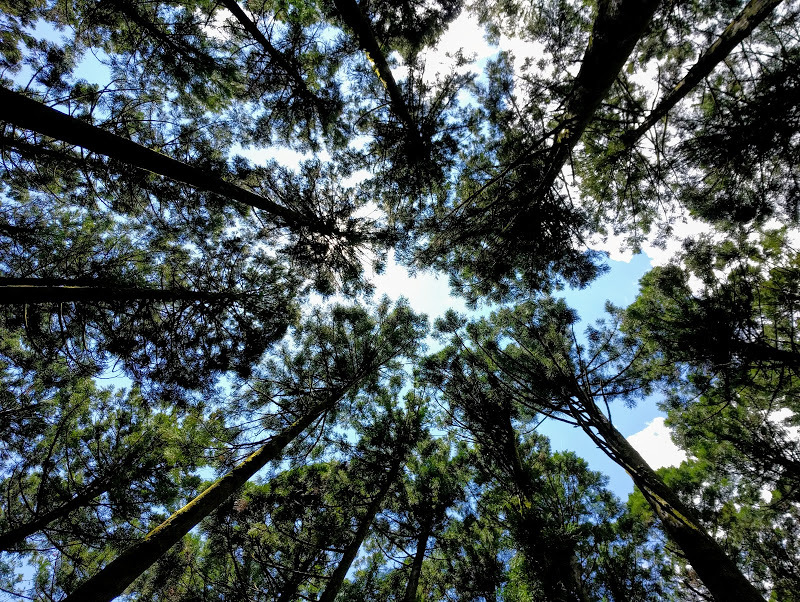 More forest. This section was all pine. 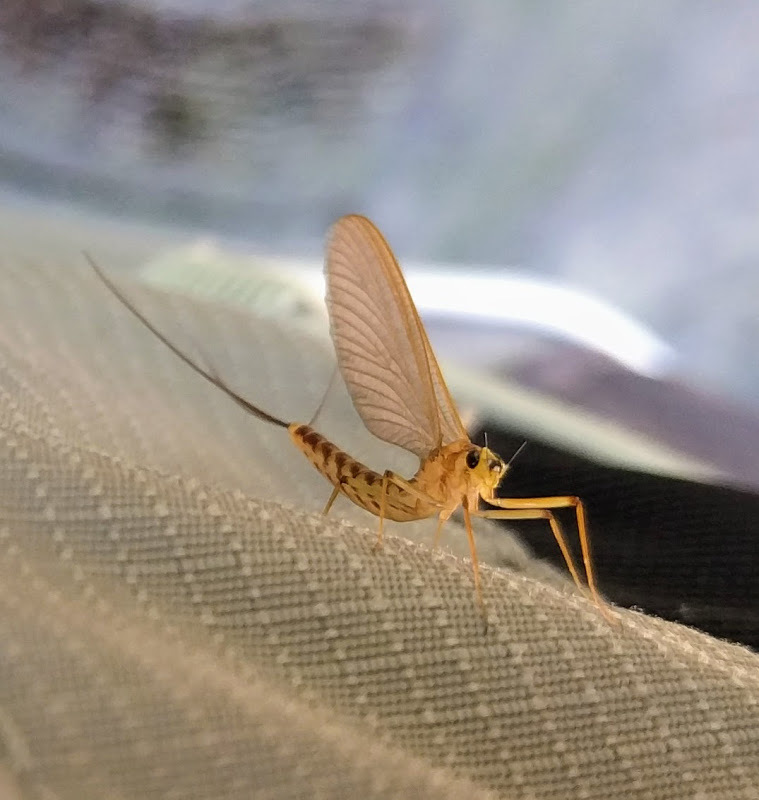 I picked up a hitchhiker. 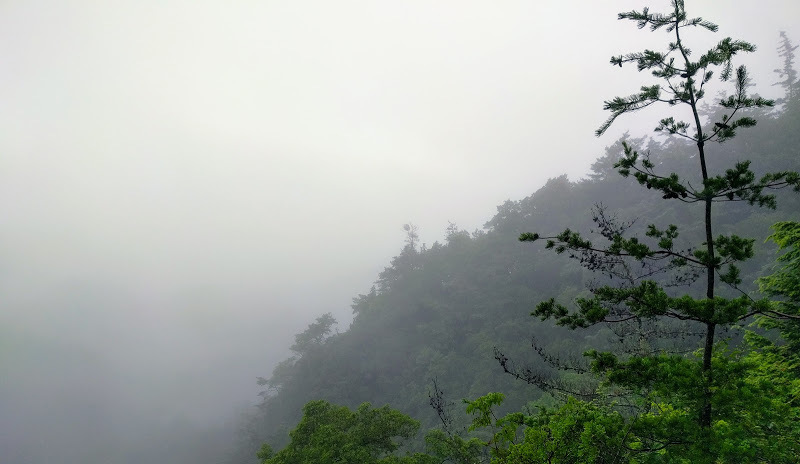 At the top of the long, slow descent towards Nachi. 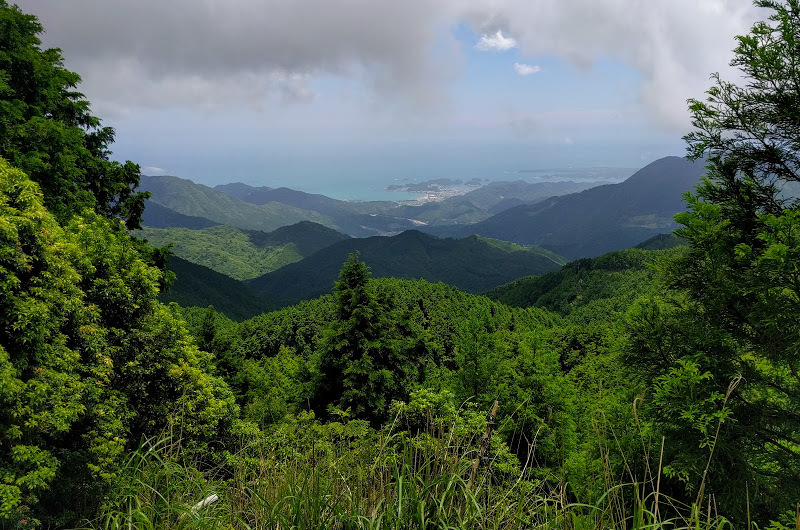 A rare viewpoint: looking down towards Kii-Katsuura on the south-east coast. 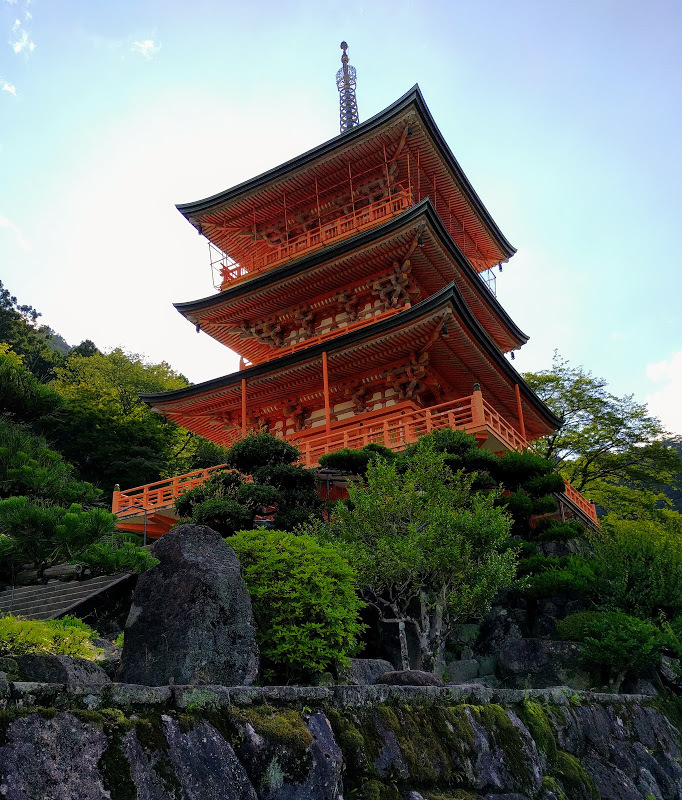 Journey's end: the Kumanonachi Taisha temple complex. The waterfall, by the way, is 130m high and is sacred in its own right. Sadly, most of the temples were covered in scaffolding, but this splendid Buddhist temple obligingly posed for me.